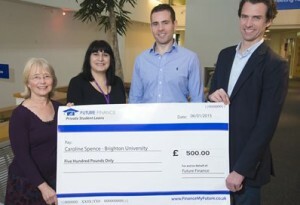 Future Finance Loan Corporation has awarded a scholarship to University of Brighton nursing student Caroline Spence as part of a campaign to help fund students in higher education. Future Finance, the UK’s first specialist student lender, held a competition last October at the Higher and Further Education Show where attendees entered a draw to win £500 scholarships for a student of their choice. One winner was Dr Nina Dunne, a senior lecturer in the University of Brighton’s School of Health Sciences. She nominated Caroline, who is studying for a Professional Doctorate in Nursing. Dr Dunne said: “I am extremely excited about the Future Finance scholarship. It will be amazing to be able to support a student financially. The student I have chosen has not been given funding for her Professional Doctorate course and therefore is self-funding. Tagged Doctorate, Health, Higher and Further Education Show, scholarship, School of Health Sciences, University of Brighton. Bookmark the permalink.